Dry skin is an irritating skin condition that affects almost everyone at sometime. The condition which is caused by an abnormality of the moisture and oil balance of the dermis layers is more common during dry, cold months but can happen year round. Symptoms of this condition include itchiness, flaking, skin scaling, cracking, and pain. While the condition can be easily treated once the symptoms occur, it is best to avoid allowing the skin to dry out in the first place. Luckily there are many natural ways to use essential oils and herbs in order to keep dry skin at bay. Not all essential oils are known for preventing dry skin. The key to avoiding dry skin lies in choosing the proper essential oils and the proper application method. 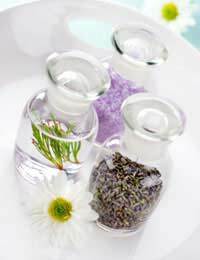 The most common essential oils that are known to contain properties that help lubricate and hydrate the skin are lavender, geranium, rose, chamomile, sandalwood, ylang-ylang, hyssop, jasmine, carrot seed, clary sage, orange, tea tree oil, and patchouli. If used directly on the skin these oils must first be combined with a carrier oil, lotion, or cream. Jojoba, grape seed, and aloe Vera all make great carrier bases for these oils. To mix an effective moisturising cream, simply combine a few drops of essential oil to 16 ounces of base and stir until combined. Then, massage the mixture into the skin. Repeat daily for the best results. If you already have a favorite moisturising cream that you like to use you can increase its effectiveness by adding a few drops of essential oils and mixing gently. You can also add a few drops of any of these oils to your regular bath water for a soothing and moisturising treatment. Simply run your bath water as usual and add five to ten drops slowly into the stream of water for instant mixing. Although all of these oils work well for preventing and relieving dry skin on their own, you can mix a few oils together in the same cream for boosted results. Oils like lavender, chamomile, and ylang-ylang work well together, as do orange, geranium, and patchouli. While essential oils help lubricate the skin to curb dryness, herbs work by softening and moisturising the skin. Herbs like aloe vera, comfrey, calendula, dandelion, chamomile, fennel, and peppermint are very effective for preventing dry skin, soothing the discomfort of dry skin and healing the symptoms of dry skin. Aloe Vera, comfrey, and calendula can be applied topically to skin to prevent dryness. Herbs like dandelion, chamomile, fennel, and peppermint can be mixed with hot water or tea to make an effective internal dry skin preventative. The herbs have been shown to boost the health of skin from the inside out thus preventing the occurrence of dry skin and other abnormal skin conditions. To get the best results simply add one teaspoon of herbs to one cup of boiling water and drink once a day. Dry skin has many causes. Lack of proper hydration, poor diet, low air humidity, excessive use of artificial heating and cooling, and the use of drying skincare products can all bring on the condition of dry skin. Because of this it is best to use essential oil or herbal treatments in conjunction with other preventative steps. For the most effective dry skin prevention regimen you need to make sure that you drink at least eight 8 ounce glasses of water each day, eat a diet that includes plenty of vitamins and minerals, use a humidifier when the air is dry, and avoid the use of skincare products that contain alcohol. Then, you need to make sure that you moisturise your skin daily, preferably after a shower or bath when the skin will more readily accept hydration, and drink your moisturising tea. By following the above guidelines you can easily end your struggle with dry skin and enjoy the benefits of a healthier lifestyle.